Today’s What’s Cooking Wednesday is a recipe that I’ve never even heard of outside of P’s family, so this is some secret information. Delicious too. And it also, again, involves eggs. I told you we get a lot of them. 1. Clean the artichokes, cut them into wedges, and remember to put them in lemon water as you go so they don’t lose their color. Boil the artichokes in unsalted water until they are about half way to tender. Remove and drain. 2. Put on water for the pasta, and prepare pasta when water is ready. 3. In a separate bowl, beat together the eggs and cheese and set aside. 4. In a medium skillet, heat up olive oil and then sauté garlic until lightly golden brown. Add parsley and artichokes, coat them in the oil, and cook for about 15 minutes or until tender. 5. Add the egg and cheese to skillet and let cook until eggs harden, adding breadcrumbs at the very end and combining them well with the mixture. Add salt to taste. 6. For ease of mixing together the pasta and the sauce, remove large pieces of artichokes and set aside. Combine pasta with the remaining mixture and then garnish with the artichoke wedges for serving. Excellent question, and I have a wishy washy answer, which is probably why I didn’t include it in the first place 😉 I’ve noticed that it varies by artichoke, but somewhere around 10 minutes should do it. You can also boil them before you cut them, but that takes at least twice as long to boil, *and* I find it more difficult to tell when they’re mostly tender as I’m no expert artichoke boiler. Shh…P’s mom likes to clean and boil them for us, so about half the time, we’re already halfway there…. thanks for the artichoke cooking tips. I usually cheat and buy the canned ones from Trader Joes. Yum, Ive just bought a dozen beautiful purple romano carciofi from the market, I should try this recipe. Sounds delicious. By the time artichokes get to Luxembourg they are old and tough. Alas I’m never in Italy at the right season to try them. When I cook them though, I stuff them right to the outer leaves and test to see if they are done by pulling a leaf off the outside. If it comes off easily, they are ready. Looks interesting, will have to give it a try sometime. Nick’s last blog post..What are haldi and dhania powder in this haleem recipe? This is a great recipe, easy and authentic like true pasta recipes; I will use it at once! Thanks and Ciao. Reminiscent of my Bleeding Expresso inspired pasta e carciofi carbonara! The egg/artichoke combination is surprisingly perfect. 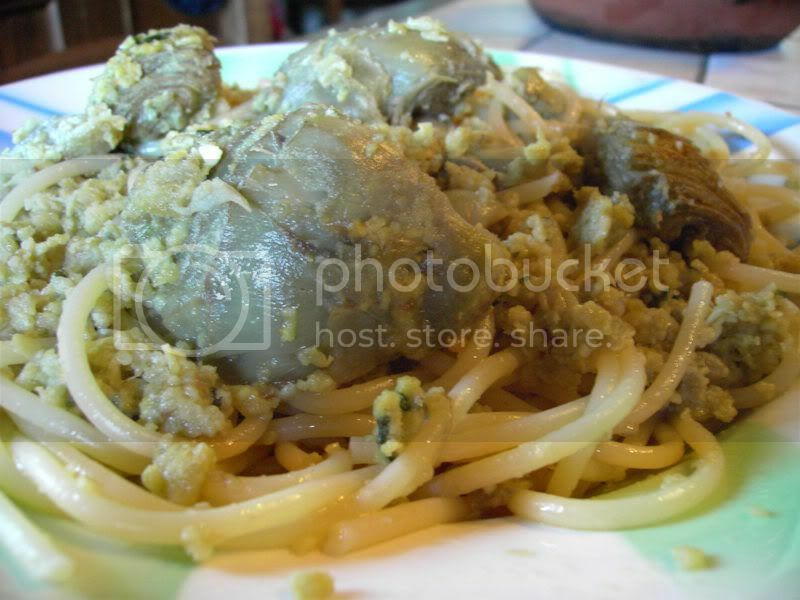 I like the idea of the whole artichokes, though have no inclination to do the prep…and thinking “boy I miss my suocera! !”….wait, who said that? Ooh I hear you; I miss the days when my suocera would hand me bags of cleaned, parboiled artichokes ready to use or freeze (she isn’t in great health anymore). But YES! ‘Chokes and eggs! YUM!